after a six-month test membership publisher Blue Cocker decided to become a full member of Spiel direkt eG. We are very happy about this decision, which enables us to continue to offer their games. You will now find "Blue Cocker" and its games in the menu item Blue Cocker. With Blue Cocker as a full member the first expansion of their game "Welcome to.." is now available. 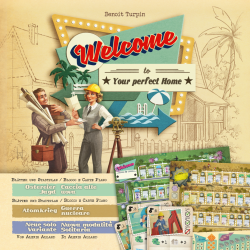 In "Welcome to ...", players are American architects in the 50s, during the Baby Boom. But beware of the competition ! Who will best accomplish the city plans by creating the nicest housing estates in the three streets he’s been assigned, with their luxurious parks and fancy pools? "Welcome to ..." is a game where everyone plays at the same time with the same cards. It’s all about cleverly combining the house numbers with their associated effects in order to become the greatest architect of tomorrow! Order WELCOME TO... now at Spiel direkt eG. 1rst Welcome to expansion : 2 new thematics and new solo mode. Welcome to... Easter Egg Hunt: grab eggs to score more points. Welcome to... Doomsday: Players are trying to save as many people as possible from impending nuclear destruction! When you build a house with a bunker you also save people equal to the house number! At the end of the game the person who saved the most people on each street will score bonus points! Order WELCOME TO... 1. EXPANSION now at Spiel direkt eG.